We try to avoid campus when the students are in town. The buzz around this restaurant, however, outweighed the potential for drunk coeds and no parking spots. 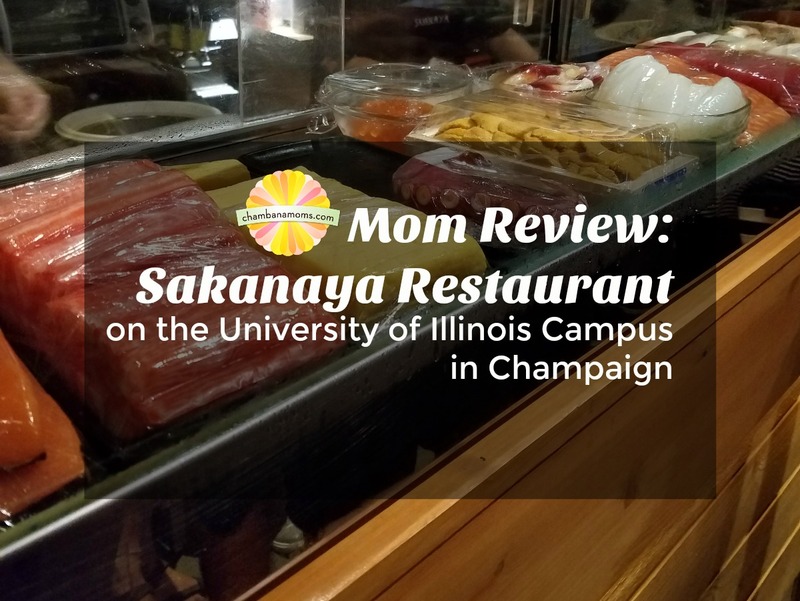 The visit to Sakanaya at 403 E. Green St. in Champaign was worth the campus obstacles though and well worthy of the buzz. Sakanaya is the little brother to downtown Champaign’s Miga. Even though the space is smaller and in a college environment, it is no less elegant and trendy—a true stand out among the other storefronts on campus. The website touts Japanese cuisine using fresh fish—a lot of fresh fish. So much in fact, they get first pick from what’s available at market because of the sheer quantity. The interior of Sakanaya is sleek and dark with lots of wood, glass and stone décor. Photo credit: Emily Harrington. We went for an early Friday night dinner date. I was tipped off to this restaurant being 1) crowded and 2) accessible through an online app called—Nowait. I imagine this app is very useful in big cities, but it only hosts a few restaurants in Champaign-Urbana—Sakanaya being one of them. We downloaded the app before we went, for they don’t take reservations. 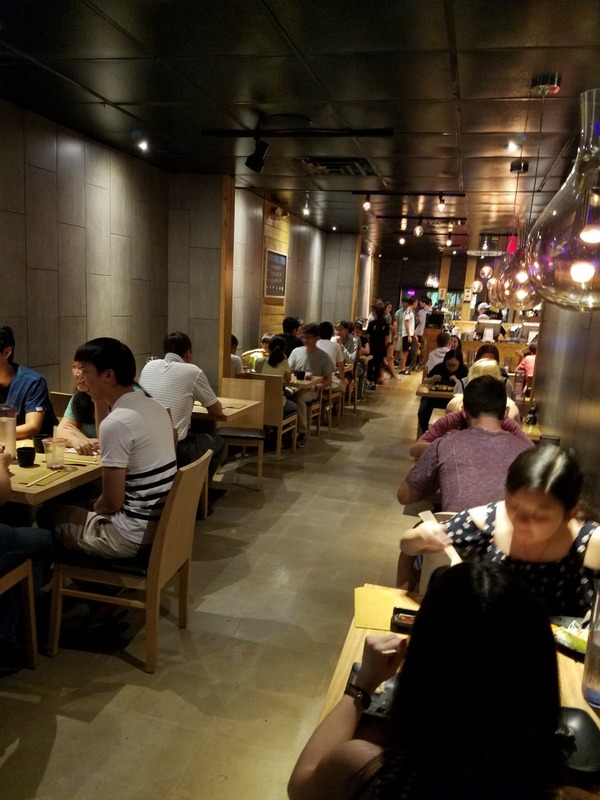 The app basically holds your place in line without having to physically be at the restaurant. You can also check and see how long the wait is in real time. We were amped to use the technology, and we were hesitant on how effective it was going to be. Basically, it made us feel old. Starting from when my husband got home from work, we were constantly checking to see how long the wait was so we could calculate when to put our name in. As soon as grandma arrived to babysit we checked and the wait was 45 minutes. We did it! We pressed the button while starting the countdown until we had to get to the restaurant. Once you are electronically notified via text your table is ready, you have five minutes to get to your table. We were taking our sweet time enjoying peace and quiet while traveling from Savoy. I had makeup on and zip-up pants—all was well. Until PING. Our freaking table was already ready!!!! ****! We had five minutes, or they were going to give our table away. The rest of the ride was spent cursing at the cars in front of us. While I leapt from the car, my husband continued to roll in front of the restaurant so he could park. Breathlessly I walked in just as the hostess said our name. She then snootily informed me that my entire party had to be present to be seated. ****! Internal monologue: My milk is going to come in in 40 minutes, the baby will start getting fussy, our toddler will be getting tired, grandma will want to pull her hair out. It’s going to take forever. Arghhh. Luckily, she added that our name only gets bumped down one table—so 15 minutes. I can handle that. My husband walked in after parking around the block on John Street’s metered parking. We were able to sit down shortly after. After I reminded her our entire party was ready (once or twice). There was a continuous flow of college kids eating. I was surprised by the crowds since it was only 6:30 p.m. The restaurant was small and narrow—sleek and dark with lots of wood, glass and stone décor. Very un-campus—new, fresh and clean with not a hint of stale beer. The menu featured lots of sashimi (about $3 each), sushi rolls, noodle bowls (about $13 each) and main dishes centered around a protein (about $17 each). A friend recommended the bul-goki to me. It’s marinated beef and onion with the chef’s special sauce for $14. I’m sure readers won’t be on campus at this time, but there is a late night menu of chicken wings and potato twists available, too. I wouldn’t describe the staff as warm exactly, but they were hard working. There was a lot of hustle moving food and people in and out. Sometimes I’ll take that over warm and fuzzy. I don’t like traditional sushi or sashimi with raw fish. So, Sakanaya might not have seemed like a good fit for me. 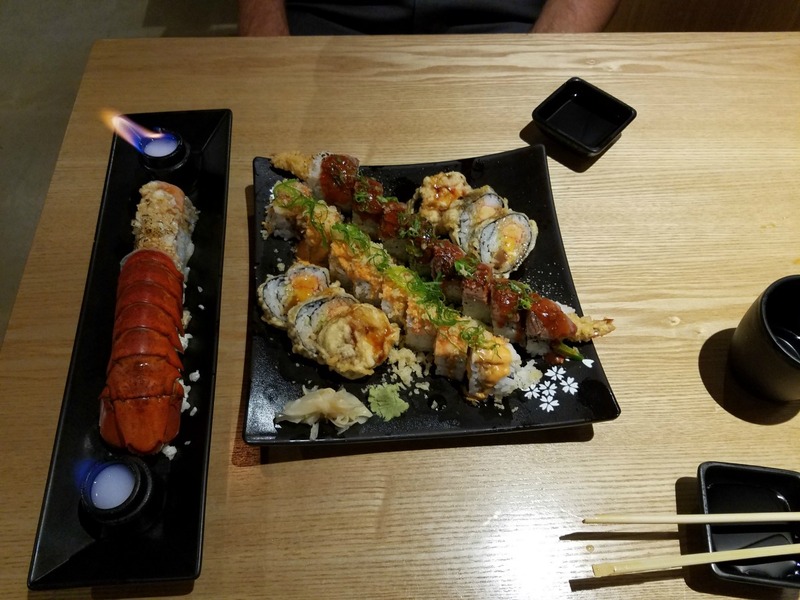 However, there were many cooked sushi options with fried shrimp or crab and lobster—lots for us to choose from. We started with edamame, gyoza (chicken and pork) dumplings and shumai (shrimp) dumplings. These were about $5 each. The gyoza had a crispy, fried side while the shumai were delicate and soft. We could have had dozens of these. A date night dinner as delicious as it is beautiful. 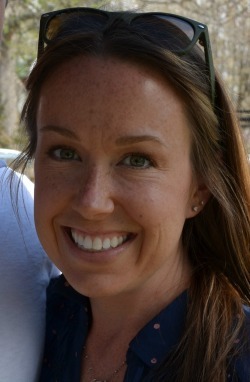 Photo Credit: Emily Harrington. Each roll ranged in price from $10-$18. Each roll was delicious. We methodically rotated through them. Our favorite ended up being the VIP, and our least favorite was the Surf n’ Turf. Looks like we leaned more surf than turf this night. The rolls were fresh and flavorful and BEAUTIFUL. The garnish on the VIP was a lobster shell and fire! According to the website, the experienced chef consistently evolves the menu, so each visit may vary. It was fast, too. Again, the workers were young and cool, but they were fast and efficient. Side note—we can eat a lot of food. We felt like we over ordered, but I left feeling just right with room for Cold Stone from down the street. Our bill was $77 without tip and without any booze. (They do serve authentic drinks.) So, it’s pricey. How college kids afford it is beyond me. That’s their parent’s problem. I thought Jimmy John’s was a luxury when I was in school. You can also try lunch Monday through Saturday. The restaurant is opened from 11:30 a.m. to 2 p.m., and it then opens again from 5 p.m. to 1 a.m. On Sundays try dinner from 5 to 9:30 p.m. Instead of using the app, you can walk in and leave your number, and they will text you when your table is ready, too. Explore campus during your wait. There is a lot to look at. Apparently flannel shirts and really, really short cutoffs are on trend right now. If you do use the app don’t take the wait time at face value, get a sitter, bring quarters for parking and get ready to feel old yet nutritionally satisfied.